The Powermat is a wireless charging system that involves plugging a base unit into the wall then placing a small charging unit onto the base. 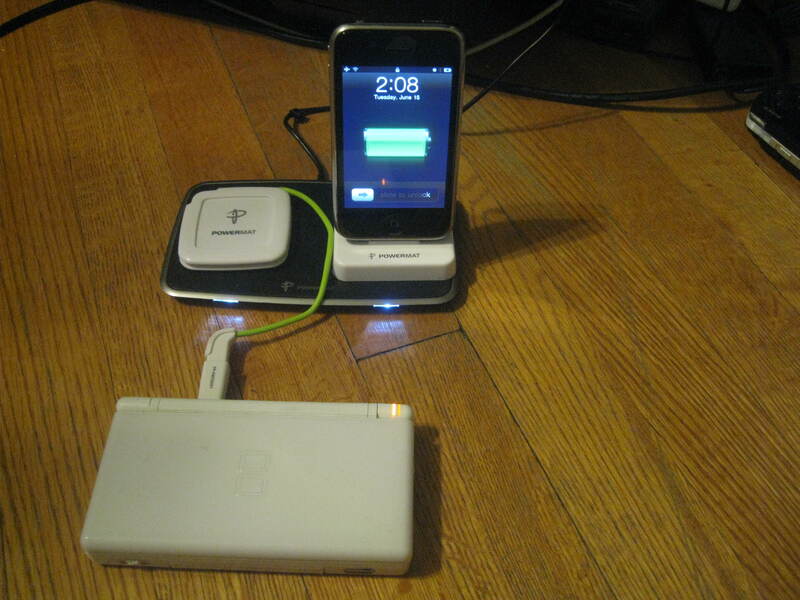 The Powermat 2X comes with a single charging puck and adapters for assorted plugs for iPod/iPhone, Nintendo DS, Sony PSP and a majority of cell phones. The 2X allows for two simultaneous devices to charge with charging units. I was given an iPod/iPhone cradle in addition to the base unit, so I was able to test two units simultaneously. By placing my iPhone into the cradle and plugging my DS into the charging puck and placing them on the base, they began to charge by magnetic induction. Both charged within a reasonable amount of time, and is a good way to charge my devices if I don’t need to sync them to my PC. I was also able to free up multiple plugs and wires for other electronic devices that I have around. I really like the convenience, but think it’s a worthy investment to purchase the Powermat battery covers and/or cases that will allow the user to place the device directly onto the Powermat base without the intermediary puck. After just a few days, I am becoming a fan of the Powermat system. The 2X is a great travel size unit for reducing the number of plugs a traveler would need to carry with them, but also fits conveniently in the corner to charge any devices that are not in use without worrying about a rats nest of cables building up. The Powermat 2X and iPod/iPhone dock are both available on Amazon.com .